Giving people on-road directions are hard enough, but when it comes to off-road it’s almost impossible. Take the extremely popular Pretoria Boeremark market, for example, with dozens of stalls and hundreds of visitors. “Turn left at the second cheese stall, walk 200m and then take your first right by the organic mushrooms” won’t work for most visitors. 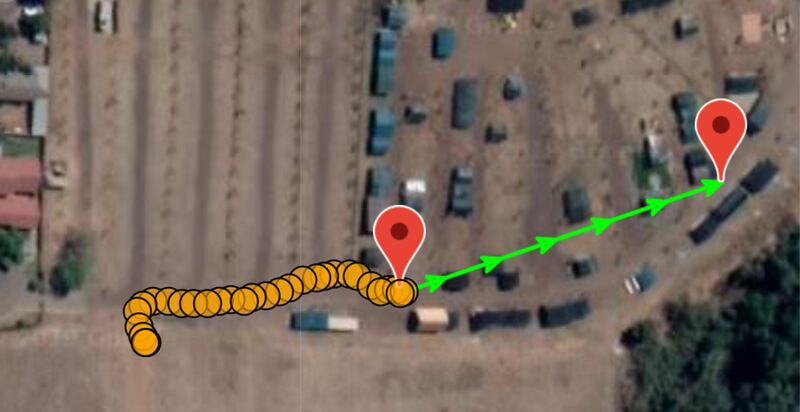 We’ve tried to make this as intuitive as possible, so hopefully that map is easy to understand: the orange dots are cookie crumbs showing where you’ve walked, the first red marker is your current location (this moves as you walk and the map keeps it centered), the green line with the arrows point towards your destination, and the second red marker is your destination. Interested yet? Here’s the fun part: the map above was navigating to the Klein Willempie Melkkos stand at the Boeremark, which has a mapcode of ZAF L5X.5SC. 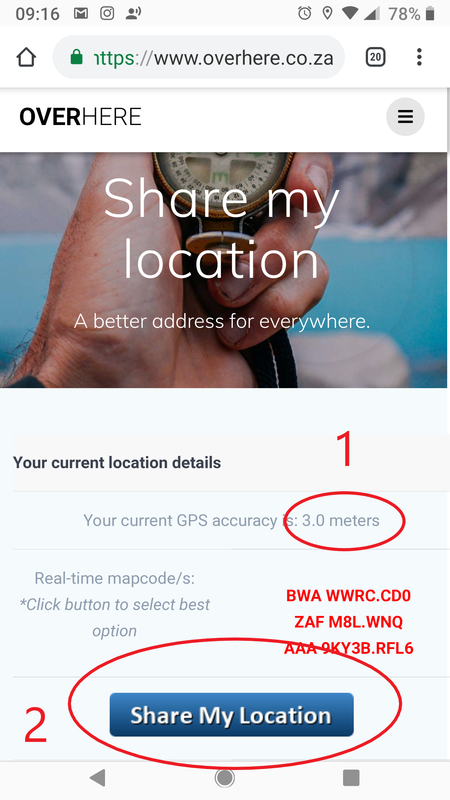 Mapcodes are basically really short addresses, like much shorter versions of GPS co-ordinates, and they have an accuracy of around 3 to 5 meters (which is accurate even in a tightly-packed market environment). Let’s say you’re a stall owner at the Pretoria Boeremark and wondering how you can get a mapcode for your own stall and share it easily with visitors. It couldn’t be easier! The next time you’re at your stall, you just have to visit https://www.overhere.co.za/live/ (the ‘Share my location’ page under ‘Tools’ on OverHere.co.za) from your cellphone. Finally, on that same screen, you just scroll down to the ‘Share your mapcode’ section and click on the ‘Off-Road’ tab (1 below) and click on the ‘Share Now’ button (2 below – which will open your phone’s sharing panel and you can select WhatsApp or Gmail or whatever other app you would like to share your direct link with). 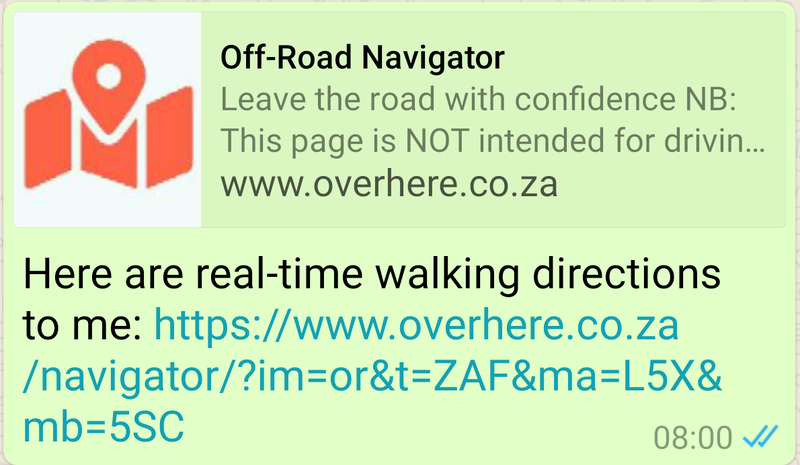 If they click on that URL, they’ll be immediately taken to the Off-Road Navigator (the map at the start of this guide) and it will automatically start providing them with directions to you. 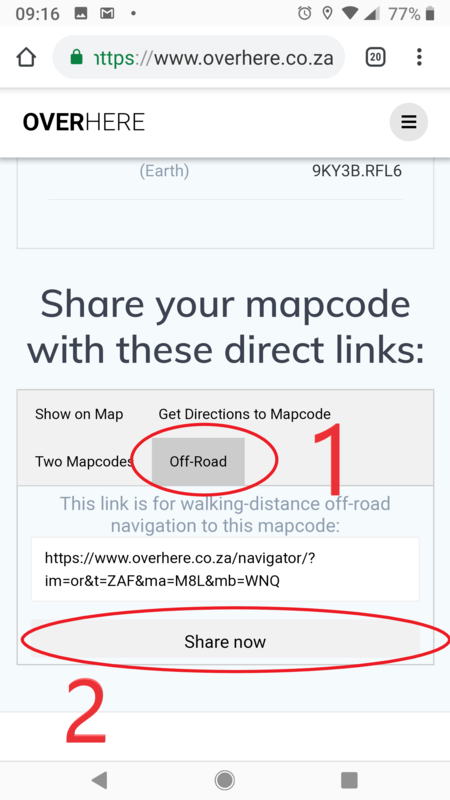 The website reads the mapcode out of the sharing URL, identifies that is an off-road navigation link, and starts navigation for your visitors (so they don’t have to click anything). Once you have your stall’s URL, you can share it with your clients on Facebook, by e-mail, on a website, by WhatsApp or SMS … any number of ways! Remember, this entire guide is for off-road navigation, but you wouldn’t want to give your visitors an off-road navigation link for on-road navigation. 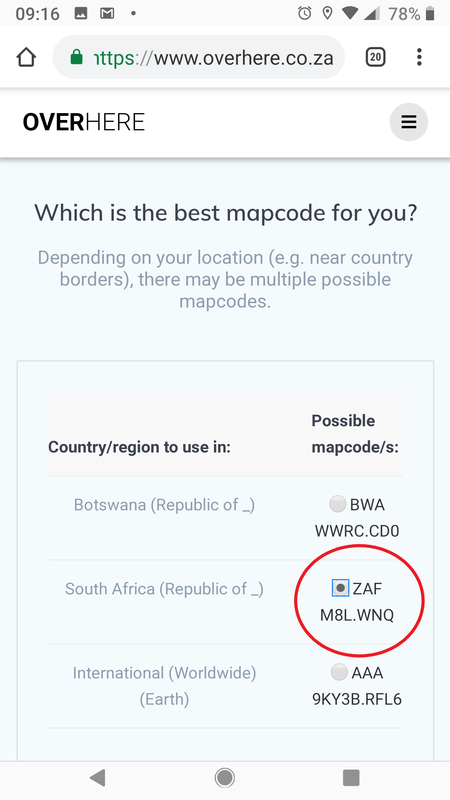 For that, you’d want to rather give them a ‘Driving Directions’ link either from the ‘Share your mapcode’ section above, or else you can visit https://www.overhere.co.za/get-a-mapcode/ (and enter a physical address or Point Of Interest – like ‘Pretoria Boeremark’ – into the searchbox at the top of the page) and the mapcode generation and sharing is all there at the bottom of that page like described above. For driving directions (e.g. 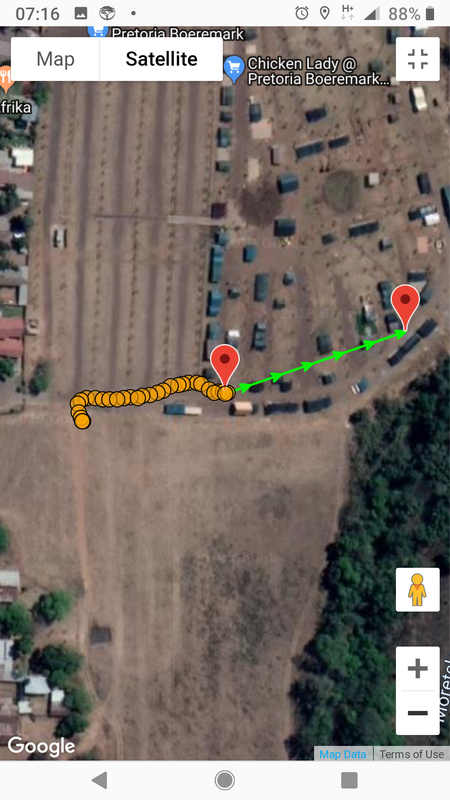 with a mapcode to the Pretoria Boeremark’s parking lot – ZAF L5Q.YZR), your visitors would just go to OverHere.co.za’s homepage (https://www.overhere.co.za/) and the website will integrate into the Google Maps app on their phones to give them turn-by-turn driving directions. QUESTIONS? PROBLEMS? USER FEEDBACK? Just click here to send us a message and let us know how we can help you!